IN THIS EDITION: In this Edition: Organic small grains auction volume up; Mercaris releases its own estimates of organic crop acreage numbers; meet our new Director of Business Development. View this email in your browser. With harvest 2016 getting underway, we thought we’d take the chance to tell you what our work at Mercaris has yielded for the organic supply chain, from grower to processor. 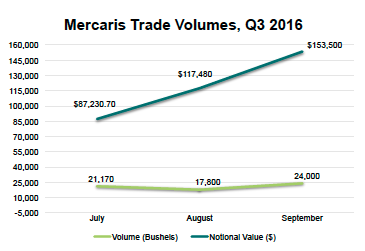 Organic and transitional small grains continue to see rising volume on the Mercaris platform. This quarter almost 63,000 bushels of organic and transitional organic grain traded on the platform, for a combined notional value of $358,000. To view prior auction specifications, or to track upcoming auctions, visit our website and create a free account. Looking to buy or sell organic, transitional, or non-GMO grain via spot or forward contracts this Fall/Winter? Consider holding your own auction, or participating in upcoming auctions. For more information please call 312-423-1875, email us or fill out an interest form here. Total certified organic crop acreage reached 4.1 million acres in 2016, with organic grain and oilseed crops accounting for 1.3 million acres, or 32%. As recently as three years ago, the US showed a significant drop in organic wheat acreage. However, a market correction is occurring and that trend has reversed course, with organic wheat acreage showing a net increase in acreage of 44%, compared to 2011. 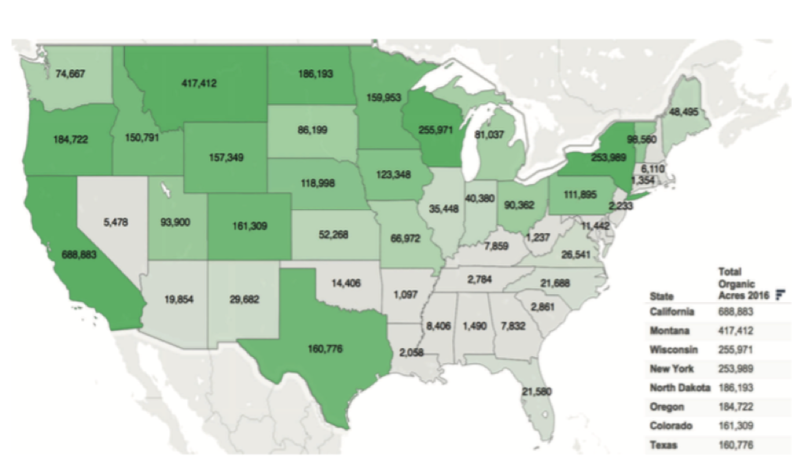 Want to know which states have increased acreage, and by how much? Contact Alex Heilman at 312-423-1875 or by email to access the full report. The Mercaris team continues to grow! 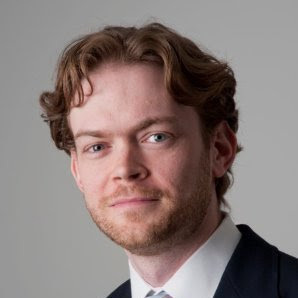 Our newest member is Nathan Clark, who joins as our Director of Business Development. Nathan will lead Mercaris in developing partnerships with other agricultural service providers, and in developing strategic opportunities for Mercaris to provide better information and new marketing/trading opportunities for our stakeholders. Nathan brings more than 15 years of experience in environmental markets, including carbon markets, clean energy, and agriculture. Nathan will join our Chicago office. Come and see us at the following events!